From time to time, we here at StogieGuys.com publish articles aimed at helping you choose the right booze to pair with your cigars. Actually, since May Patrick S has owned this series with excellent Stogie Spirits pieces on the mint julep, several Sam Adams varieties, and the elusive Johnnie Walker Blue Label scotch. While his expertise lies in horseracing cocktails, premium domestic beers, and high-class whiskies and scotches, I tend to be more of a rum guy. Call me crazy, but I like a good Caribbean drink with my Caribbean-grown tobacco. So today I’ll give you the low-down on El Dorado 12 Year Old Special Reserve. Made by Demerara Distillers, Ltd. – a Guyana-based company that has been “lifting the spirits” since 1670 – this rum can be purchased for about $24 per 750 ml. bottle. That’s a fair price, especially considering all the accolades. This particular blend earned a gold medal at the annual Caribbean Rum Taste Test an impressive seven of the ten years for which the competition was held. Most recently, it was awarded a gold medal at the 2007 Ministry of Rum competition. My own impressions are not dissimilar. The first thing that strikes me about the rum’s flavor is that it’s tremendously sweet. Rich syrup notes abound with a full, spicy aftertaste. Whiskey-lovers will enjoy the smoky hints, probably a result of the rum’s aging in old bourbon oak casks. While you’re supposed to enjoy a rum of this character straight or on the rocks, I find it’s almost too sugary for those methods. To escape visions of painful trips to the dentist, I recommend adding a splash of Diet Coke. 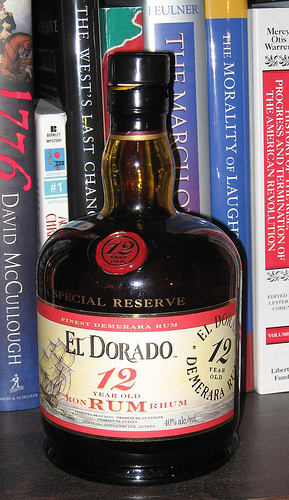 If you enjoy sweet rums, El Dorado 12 Year Old Special Reserve is definitely up your alley. Either way, make sure to pair it with a spicy/salty cigar that will balance out the sugar. Some good match-ups that come to mind include Joya de Nicaragua, a Romeo y Julieta maduro, or a Don Kiki Brown Label. Great post. This rum has a lot to offer, but I agree that it’s too sweet — even for a drink made from molasses and sugarcane. These stogie spirits articles are kickass. I love drinking!